The system’s owned and created by Ivstitia Limited are accredited to store and process OFFICIAL and OFFICIAL-Sensitive information in accordance with HMG requirements (the Security Policy Framework) and CESG guidance. It has been assessed against the HMG Baseline Controls, which correspond to the good commercial practices described by ISO27001/2. As part of the accreditation process, a Technical Risk Assessment has been produced by a CESG Listed Advisor Scheme (CLAS) consultant and an independent IT Security Health Check has been carried out. Our IASME Consortium Certificate of Assurance show that as a whole company and assessment has taken place and we comply with the IASME Governance standards. 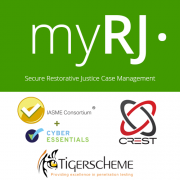 .RightCue assessed and certified the as a whole company had met the cyber essentials implantations profile published in February 2017 and thus that. That at the time of testing, the organisations ICT defences were assessed as satisfactory against commodity based cyber attack. Dedicated Cisco ASA 5560 X Security Plus with FirePOWER Hardware Firewall. Encrypted Session Data stored server side.